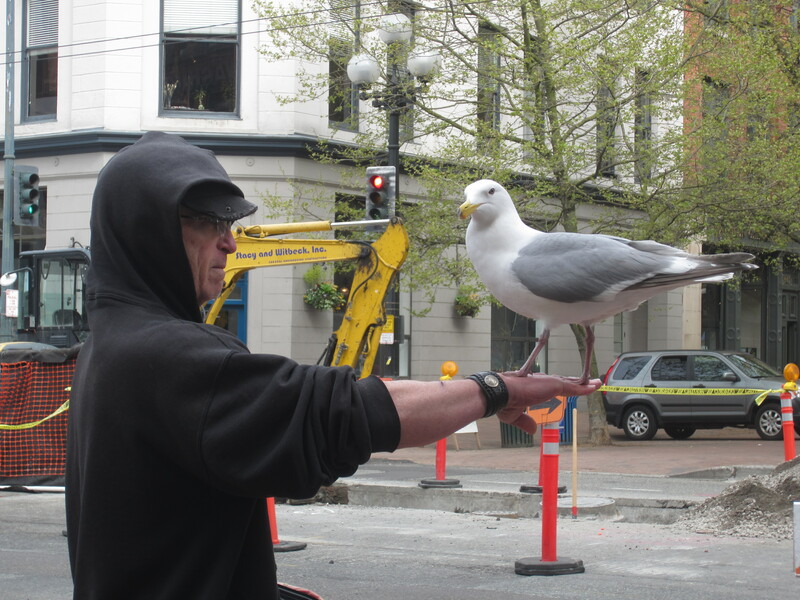 Although Dan did not wholly welcome gulls, there was one he had a special relationship with. After months of feeding it grew comfortable enough to feed from his hand and shortly there after what was once “hand feeding” became “on the hand feeding”. Now it waits for him to finish up with the crows before they have their daily exchange. After days of less than consistent feeding by birds near Century Link Field, I was scratching my head at why I was having such a hard time attracting birds to my food pile. Lucky for me, a curious dog walker asked what I was up to and after explaining my project, he pointed me in the direction of another crow feeder just down the block. After my trial was over I packed up my things and hoped that I might catch this other feeder before he left. Armed with a bag of dog food (and no dog) Dan was easy to spot at the Starbucks the passerby told me he would be at. Sitting down to talk with him it became abundantly clear why I was having such a hard time getting birds to feed from me: Here, just a few blocks away, was someone who had been feeding the birds for over a year and provided an exponentially superior food over my “crumby” bread. Although his out competing me for crows had been problematic over the past few days, discovering Dan presented an invaluable opportunity to take advantage of birds that someone else had already conditioned to a feeding regime. With Dan’s blessing I incorporated his routine into my study, letting him feed the birds while I took data and eventually presented the birds with a stimuli. Although the use of “his” birds was a great asset to my project perhaps more so was his depth of knowledge after having fed the birds for so long. His feeding suggestions, his knowledge of the crow’s territories and routines all reminded me of the great advantage of being a citizen scientist. Without deadlines, or the need for publishable and repeatable methods, Dan was free to just try new things out and see what worked. Most impressively, he had developed an ingenious technique for selecting out gulls and pigeons-a magnetized feeding dish that attached to street signs to thwart non-perchers, and a squirt gun for the pigeons. He had an intimate level of knowledge of his local birds, something that I will not have time to achieve during my project. Although the city dweller may compelled to ignore their urban wildlife in favor of more “wild” animals, Dan was an excellent reminder that one does not have to travel or have the blessing of an institution to conduct their own animal behavior experiments. With a little bit of time and persistence anyone can become a great urban naturalist.